The Sydney Harbour Bridge is one of the most memorable landmarks in the city and is known locally as 'The Old Coathanger'. Completed in 1932, this structure is one of the modern wonders of the world, but before the bridge was built the only way to cross Sydney Harbour was by ferry or to take a road journey around the harbour, which was approximately 12 miles / 20 km. 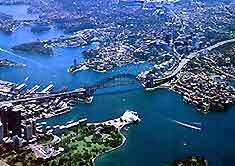 The Sydney Harbour Bridge is a hub of activity and features eight lanes for traffic, two railway tracks, a cycling path and a pedestrian walkway. 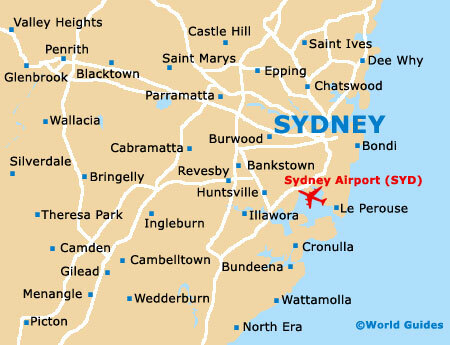 The Sydney Harbour Bridge is situated close to the Sydney Opera House, and it spans over 1,650 feet / 503 metres long. The Pylon Lookout is an additional adventure for everyone that visits Sydney Harbour Bridge. After a 200-step walk to the lookout, visitors can enjoy some of the most beautiful views of the city of Sydney. Inside the Pylon Lookout on Sydney Harbour Bridge there is a museum with displays detailing the construction of the bridge, including many photographs. 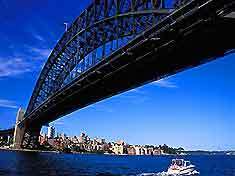 Visitors to the magnificent Sydney Harbour Bridge can also take the BridgeClimb. This entertaining tour takes approximately three hours to complete and everyone wishing to do this climb must have a head for heights. Visitors are attached to a safety rail by a harness and then taken by guide to the top, which is 439 feet / 134 metres above the busy harbour waters. At the top of the BridgeClimb it can be windy but everyone is photographed and will enjoy the memorable and breathtaking view across Sydney harbour and the city of Sydney.